Most beginner preaching classes use the epistles as the foundational preaching genre. 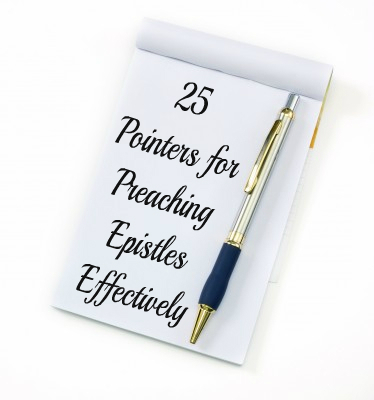 We can end up thinking that preaching epistles is easy. After all, a passage in an epistle will tend to fall into “chunks.” Voila! Sermon. Hang on, there is more to preaching epistles than that. Nine nudges, ten tips, well, how about 25 tips? That should keep us going for the week! 1. Drill into the occasion – Why was the letter written? Remember that epistle writers weren’t just letter pen meander over papyrus for the sake of it. They were prompted to communicate by some situation. Therefore a letter is a snapshot of a narrative. Be sure to read through the letter itself and look for all the clues in the text. 2. Check other biblical background – With ten of Paul’s epistles, you also have the fertile territory of Acts to explore. What background is available by a close study of the relevant Acts material. Its good to know which journey each letter was written on, as well as what other letters were also written at that time. Fill in the background for your own benefit, and maybe also for the listeners. 3. Fill in your background knowledge – The biblical text is your main source, but be sure to check out whatever else might be helpful to understand. What was the geography of Ephesus at the time, what does an incipient Gnosticism look like, why do dualists tend to end up at one or both of two extremes? Other good reference material will be helpful. 4. Keep re-reading the epistle – That is the beauty of epistles: they are relatively short. So keep re-reading as you study background and the flow of thought will become clearer and clearer. Read the epistle so much that it isn’t just the famous verses that stand out, but until the whole text starts to sing. 5. Become familiar with the letter-frame – Too many Bible studies and sermon series skip the beginning and end of the epistle. Don’t. Dwell on every detail – author, recipients, greeting, thanksgiving, biographical prologue, main idea . . . what are the added details, what is missing? And how does it end? Why does he say that?